The project aims to establish protected piped water supply to 150 rural households benefiting 829 people in 4 rural villages at the Gajapati district in the state of Odisha. Provision of potable water and clean sanitation facilities will bring about a qualitative change in the lives of poor and ensure them access to basic human amenities. The health status of people especially women and children will improve with the reduction in the waterborne diseases as supply of water from a protected water source is established and unsanitary practices like open defecation were eliminated through the construction of Toilets and Bathrooms for each and every household. Apart from constructing physical infrastructure like TBRs equal emphasis is also laid on enabling a behavioral change in the sanitary practices of people by undertaking vigorous personal and community hygiene campaigns. Since women have a direct role in the health status of family and children as they are the ones who prepare food for the whole family and take care of children, hygiene education will be focusing on and carried out through women groups like SHGs. Children also act as agents of change; therefore hygiene education will be imparted in schools that encourage children to keep personal cleanliness by using soap after defecation to wash hands, wearing neat dresses, keeping nails short and clean etc. Individual kitchen gardens are promoted in every household by making use of waste water coming from bathrooms and papaya and banana plants are grown in these gardens. It helps to reduce the chronic issue of nutritional deficiency to a certain extent. Gram Vikas’ approach also emphasizes on enhancing the vocational skills of rural youth by providing training in masonry. On completion of the training, they construct the toilets, bathing rooms and overhead water tank. Independent studies have later revealed that these trained youths have become successful masons in nearby towns and cities and their employability and income levels have been multiplied. The entire project is implemented through village executive committees representing all sections of the village community. Democratic process of decision making, social and gender equity and sharing of responsibilities/cost etc will bestow a spirit of unity to the village community and empower them to carry forward the development process initiated. Gram Vikas has designed a sustainable model for community organization and development named MANTRA (Movement and Action Network for the Transformation of Rural Areas), based on five core values of 1) 100% inclusion 2) Gender equity 3) social equity 4) sustainability and 5) cost sharing. Water and sanitation activities have been taken up as entry point activity for initiating all round development of villages. The management of the project is undertaken by the Village Executive Committee (VEC) comprising of 6 men and 6 women, all of whom are elected in a democratic way. In addition to constructing the water and sanitation infrastructure, Gram Vikas spend time building the capacities of this committee to enable them to gradually take over the entire responsibility for managing the water and sanitation infrastructure after Gram Vikas’ withdrawal from the village. Gram Vikas is an approved project implementing agency for the government’s Swajaldhara water scheme and is also the implementing agency for Orissa Tribal Empowerment and Livelihood Programme. Gram Vikas also facilitates the BPL households to avail the subsidy of Rs, 2200 under Total Sanitation campaign. Water shed activities are undertaken on the catchment of the water source especially for gravity fed systems to ensure replenishment of ground water in the aquifers and thereby sustain water supply even in the dry season. Government usually prioritizes bigger villages for implementation of water supply projects and the small, hilly tribal habitations are left to fen for themselves. There is hardly any intervention in these small habitations that can help the people to get safe water. This proposal seems to be good for the small village that to hill area. It is good to use the fresh natural water for purification and supply it through the pipelines to the poor people. If you can do the water analysis atleast two months in once, it will ensure the quality of the water. Gram Vikas has been doing commendable work in the very backward tribal region of Orissa and has vast experience in rural development. We wish the very best to them. 1. What is the unit cost of one individual toilet and construciton of bathroom?. 3. The subsidy of Rs. 2,200 is only for the BPL families. How do the non-BPL families manage the construction work ? Is there any other subsidies grant for construction of toilets under tribal sub plan? GV mobilises funds on an average of Rs, 3000 per family towards the cost of external materials for the construction of toilets and bathing rooms, BPL families get and addiitional assistance of Rs. 2200 from the government. The rest of the cost is borne by the respective families. GV wolrs on the 100% approach where the economies of scale come into operation when the entire village arranges the materials for all. This provides a slight reduction in cost, however quite substantial amounts are borne by the families. In many cases local leaders are encouraged to approach their MLA to leverage funds under LAD and this has also provided additional support in many cases. Hope the answers help understand better. You have described nicely the 2 options for securing a water source. Isn't there a noticeable difference in costs? Wouldn't the costs change depending on whether a spring is located? I have heard you describe the option to not have a holding tank as the spring provides continuous supply. Have you implemented it? Any experience with it? A small hint on the options will help to answer . We have tried in some villages of not having an overhead water tank but allow the well and the pipeline to act as a storage tank and supply to villages. This is done is villages having less than 40 families. This has worked well only in instances where some houses are located in a higher elevation than others or at the tail end , there is problem of pressure , and those families face difficulty when everybody is using the water (at peak times in the morning or evening), We have tried to use control systems/ valves to overcome but it isvery situation speciifc. Thanks for your prompt responses to the questions, almost all of my questions are already answered here. Looks like a well thought out project, as usual with GV. How do you manage the contributions from the community? Do they manage the funds and purchase materials directly or do they submit that to GV? A new (although an old idea) methodology springing up around here (that we haven't tried yet) is having the community manage the whole process and finances for the project - hiring any foreman/woman, buying materials, etc. rather than the NGO managing it. Just wondering how your methodology looks in this particular. We do have community (and municipal) contributions here as well, but our communities manage those funds, but we haven't got to the point of having the communities manage funds beyond that yet. We may pilot something though in the next year or so. As I had explained earlier- GV supports only upto Rs. 3000 per family towards cost of external materials for the toilets and bathing rooms. The option is given to the village committee , if they want to procure materials by themselves- cement, toilet pan etc they are free to do it , in case individual families want to purchase their own materials, we encourage them to puchase it on their own and GV will reimburse upto Rs. 3000 of the cost of those materials. In case of water supply, it also depends upon the villages , we let them know the rates of the materials and the type of materials required, if they are willing to purchase ,they go ahead, else we procure it on their request. However for the operations and maintenance, all costs like a pump operator , electricity bill etc is borne by the community only. The way you describe dispensing with a surface spring is to insert on the side of the well a pipe which is connected to the conduction line that leads to village tanks. That, I understand to be a siphon. But a siphon only can work if the water is raised something less than 7 meters (depending on the altitude of the well and the air content of the water . Does this mean that the water level in your wells is that high? and incidentally how do you start the siphon, (a minor problem if it works)? 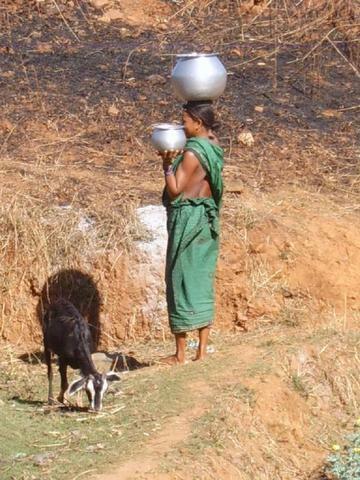 The wells are located in a higher altitude than the village and where the water tank is to be placed. There should be a minimum altitude difference of 20 ft between the bottom of the well and the water tower. We insert the pipe about 2.5 ft above the well bottom and as the terrain of the conduction line is undulating and a slope is there the water starts flowing into the pipeline. We have to put air valves at some intervals especially when there is a rise and fall of the terrain. Where the pipe is inserted at the bottom, we also seal the opening with some cement mortar so that water does not leak out through the other gaps. 1. I agree with Dhanam about testing drinking/cooking water for contaminants. Advisable to have analysis, chemical and bacteriological, done before construction, if possible, unless you already have the reports from other sources. Followed by at least once a year, only the probable ones for instance bacteria if the source is an open spring. 2. The maintenance cost is $1286. There is no explanation of what kind of maintenance is required for such water system and sanitation. 3. And I may have missed out how will the maintenance money be generated as at the initial stage the community is contributing $7390. This amount comes from collecting INR 1000 from each of the 150 families. Please correct me if I understood wrong. That adds upto INR 150000 ($3409 with exchange rate being 44). Does this mean each family will contribute 2000 for water supply and sanitation? 4. Is the budget for the sanitation project submitted elsewhere? For the excel file contains budget for water system for 4 villages and detail on one sheet. 5. Do you have any pictures of this http://peerwater.org/projects/157 project uploaded after completion? Can you kindly direct it to me. 6. It definitely gets hard to track the activities of the staff and the field workers once the organization gets big. Do you log current monthly/quarterly/annual reports of the historical projects in your organization? If so how? I had sent a detailed mail to your queries, but am confused whether you received them or not , since I am not able to view the answers! Can you please confirm whether the reply from my side has reached you? Hi Chitra, No i have not received any email yet. Will keep checking. Thanks. As I am traveling and my laptop computer is busted I cannot access my email sent to berkeley.edu for I use outlook. can you kindly upload your response here before 25th. Please share that mail info with all the reviewers. I am sure all of that is of interest to all and also helpful in understanding this application. That's the whole point of this peer review, to eliminate bi-lateral exchanges of information that can get lost and do not benefit the greater community. Please share that mail info with all the reviewers. I am sure all of that is of interest to all and also helpful in understanding this application. That's the whole point of this peer review, to eliminate bi-lateral exchanges of information that can get lost and do not benefit the greater community. I once again attempt to answer to your queries. 1. We do test the water quality using easy field test kits for parameters like pH, Nitrate, suplhate, carbonate hardness, total hardness, chloride, iron. We usually donot collect surface water, we make an "intake well beside a stream or where the topography allows for making an intake well that could yield water. The side of the well is cut and a pipe inserted at the bottom of the well, and the well is bound and covered . the water flows in the pipe through natural gravity pressure. 2. In gravity systems there is minimal maintenance , however we ask the people to raise a fund in case they need to replace pipes. Therefore Rs. 30 per family per month is collected and the calculation is done for 150 families for an year. 4. The budget for the toilets has been sanctioned in the last year as the villages mentioned in the list have nearly completed the construction of toilets and bathing rooms and are ready to do the water supply. 5.GV ahs an internal monitoring system where at the start a Village profile and household survey is done, thereafter Monthly progress reports come from each village, field visits are done to assess the progress and in review meetings the Coordinator and staff present the progress. All these systems help track the progress of work. No report on the 195,511 project on water, sanitation and beyond. Would like to see more recent reports on the historical projects implemented so far. In this project the costs are commendably low. I find several of the technical details of the construction too vague. As a professor of fluid mechanics at the Univ. of Berkeley for many many years, I can tell you that the hydraulics explained by Chitra are completely wrong. As my latest comments indicate, perhaps this is due to the fact that the presenter is technically innocent and that the scheme works but if it does, it works in an entirely different way. So on technical ground I would oppose the project until some valid explanation for the proposed method is advanced. On the community organization level, the project seems solid. Good clear project - an extension of the decades of experience. Communication on the platform and post-implementation has been an issue. Hope GV shares more, we have a lot to learn from their decades of experience and experimentation. The project have simple method to harvest water from the hill area and supplying the water to the households based on the gravity than the energy. This is an environment friendly activity. We recommend this project for the PWX funding . The reply of the query to GV is awaited and the rating is given as today is recycle end date. Excellent. No doubts in my mind, this is worthy of funding. Some items, especially summary are cut off in application, and could have been a little clearer on the sanitation piece, but the Q&A cleared everything up.